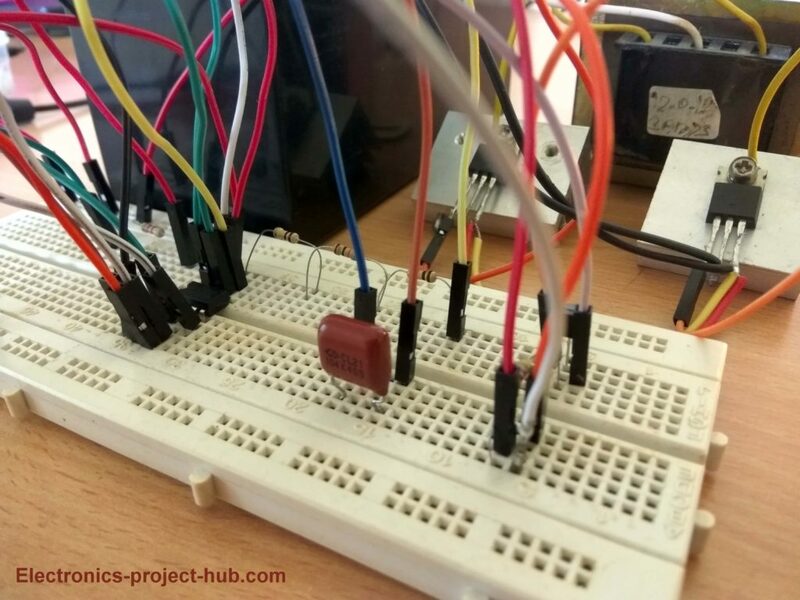 In this post we are going to construct a beginner friendly Inverter using IC 555 timer. We will explore the proposed inverter circuit in-depth and also we will learn how to debug the circuit at different stages to solve the issues that could arise with this inverter. There are many inverter circuits using IC based oscillators around the internet, but none can beat the popularity of IC 555 which has tons and tons of applications in timing based circuits. Inverter is also a timing based circuit whose frequency and duty cycle are important parameter. The IC 555 can handle it like piece of cake. Moreover the 555 timer is already a popular IC among the new comers of electronics and also among much experienced hobbyists and all would find easy to work with IC 555. By looking at the circuit you would have got an idea how easy the circuit is, now let’s deconstruct each stage and explore. The oscillator circuit converters DC current from battery in to AC current at lower power level; the frequency and duty cycle are determined at this stage. The oscillations will be amplified by the next stage using MOSFETs. The frequency of the IC 555 is determined by the two resistors and one capacitor. Here we are utilizing 4.7K and 120K values for resistors and we have chosen 0.1uF value for capacitor. The values are chosen carefully to meet the 50Hz and 50 percent duty cycle requirement as close as possible. So, after many calculations we concluded the values for the two resistors as 4.7K and 120K and the capacitor value as 0.1uF. Using these values we can achieve close 50Hz and 50% duty cycle. In real life we will get around 55 Hz (depending on tolerance of components used) which is good enough for low power application like chargers, CFL lamps, table fans, tube lights, incandescent lamps etc. One important factor we should always take care is the duty cycle. 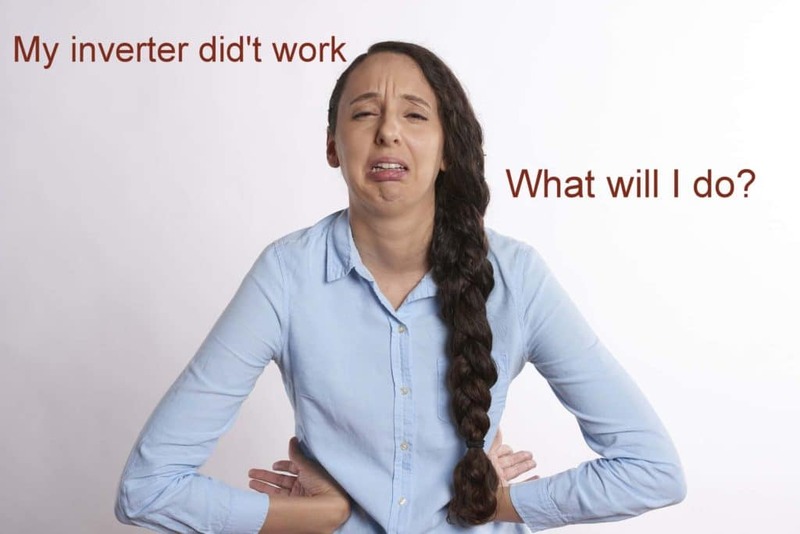 Getting 50 % duty cycle i.e. equal amount of ON and OFF time is very important for an inverter. We can witness from the oscilloscope that we are getting very close to 50 % duty cycle and also getting around 58Hz as per our calculation (good enough for 50/60Hz low power devices). Excess heating of transformer’s winding, that could leads to malfunction of transformer. Noise from the transformer’s winding. Noise from the connected gadget. Improper operation of the connected gadget which could lead to malfunction. Now the oscillations are generated as per our requirements, but the frequency signal is so feeble that it cannot drive the transformer to step-up the voltage. To do this we need some kind of amplification device to increase the strength of the 50Hz signal from the IC. This can be done using transistor; we generally don’t use BJTs as it is a current controlled device, which means we have to apply some current (much higher than IC 555 can handle in this case) to the base terminal of the transistor only then we will get the desired output. The transistor also gets hot due to higher internal resistance of the BJT; like 2N3055. 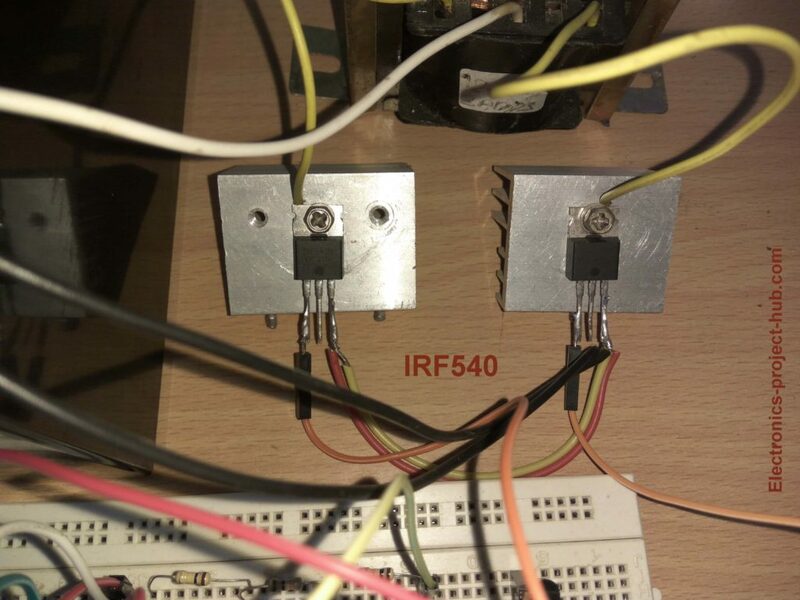 So we are using MOSFET which is another classification of transistor, it just need the weak signal from the IC 555 to get the necessary current to drive the transformer as per our requirement. MOSFETs have very low internal resistance, due to this the MOSFETs get barely warm at lower to medium loads. You no need this big and thick heat sinks; a smaller metal plate with 1 inch x 1 inch will do the job. You can use this configuration if you have a transformer with winding of 0-9V at secondary. From the oscillator circuit (IC 555 and from BC548) we have generated two signals which are 180 degree out of phase; meaning if one of the signal wire is HIGH and the other signal wire is at LOW state. This signal is applied at the points A and B. At any given point only two diagonal MOSFETs are turned ON and the other two diagonal MOSFETs are OFF. Now let’s say at point ‘A’ is HIGH and point ‘B’ is LOW, the top left MOSFET and bottom right MOSFET will turn ON and we will get (–Ve) polarity at bottom and (+Ve) polarity at top across the transformer terminals. In the next cycle the point ‘A’ turns LOW and point ‘B’ turns HIGH, now the top right MOSFET and bottom left MOSFET will turn ON thus giving us (+Ve) polarity at bottom and (-Ve) polarity at top across the transformer terminals. This cycle takes place 50 or 60 times per second thus we get alternating current at the transformer’s output. What is the function of BC548 transistor in the circuit? In the full circuit diagram you can spot a BC 548 transistor, if you are wondering why, this is for creating an inverted the signal, so now we have two signals; one from IC 555’s pin #3 and from transistor’s collector. You can see two points (wires) has been marked as A and B. At these two points at any given time one point is HIGH and another point is LOW. There are two MOSFETs to energize the two coil windings alternatively, to switch the two MOSFETs alternatively we should apply signal that is opposite to the each other’s state. You can also apply these two signals to H-bridge MOSFET driver as shown above, still we will get the desired output from the transformer. 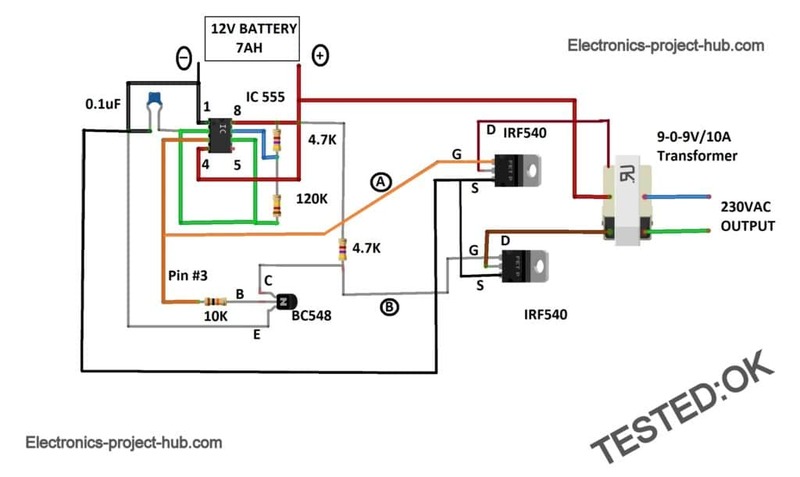 The proposed circuit is well tested and it should work for you too if you follow the circuit diagram precisely. As a beginner there is a good chance that it might not work in the first attempt after construction. Here we are going to debug the possible issues and solve it stage by stage; in the end you can make your inverter work. First you should check whether the IC 555 is generating any oscillation. You can easily check it by connecting a speaker across points ‘A’ and ‘B’. You should hear a buzzing sound from the speaker which means the IC 555 is generating signal, if not IC 555 is not generating any oscillation. Solution: Check the wire connections associated with IC 555 and its orientation. If IC 555 gets very hot, it means you kill it, replace with new one. There is a good chance that most beginners fail to create this stage successfully in the first attempt, so please give more attention to this stage of the inverter. If your both the MOSFETs are damaged there will be no output at the transformer. 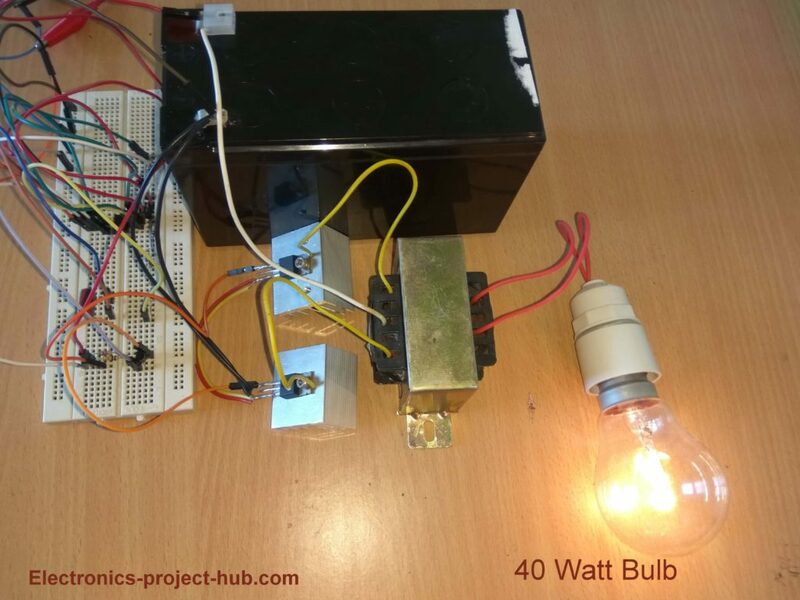 If one MOSFET is damaged and other is working fine, the transformer creates noise when loaded and output voltage swings and if you connect a light bulb you will notice flickering. Solution: Replace the damaged MOSFET in the circuit. If both the MOSFETs are working properly you will get very low noise from transformer which is expected from any power inverter. 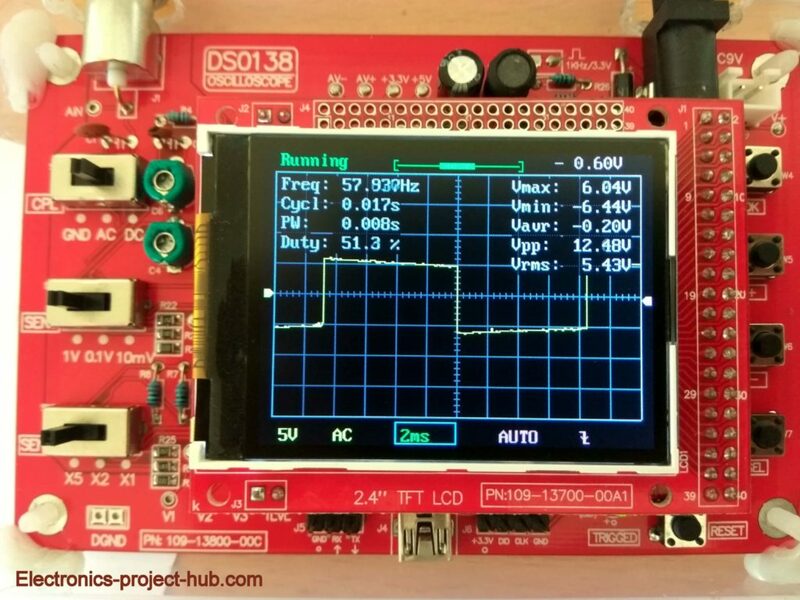 NOTE: Before you come to the conclusion that MOSFETs are damaged, please check the MOSFETs with multimeter, there are plenty of tutorials online to check MOSFET using a multimeter. We are using an ordinary step-down transformer in reverse to step-up the output voltage. You should test the transformer only after the above two steps, issues with the transformer are rare. 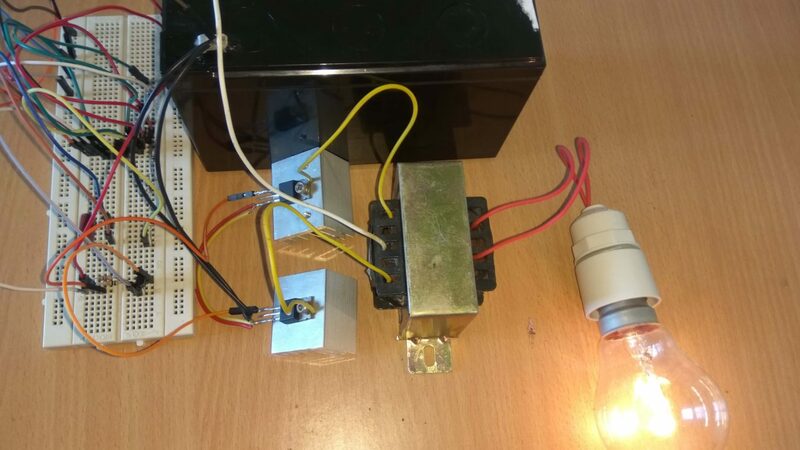 If you salvaged a transformer from a very old appliance (more than 10 years), we recommend not using it for testing. Solution: You can test the transformer by connecting the 230V primary to 230V AC mains and measure the voltage at the secondary winding. How much power this inverter can deliver? The maximum power this inverter can deliver is depend on the specification of the transformer. Say if you have a 9V/10A transformer, at best it can deliver 9V x 10A = 90 watt. If you want 200 watt output from this inverter then you need to switch to bigger battery like 18Ah and a transformer with rating greater than 9V x 22A = 198 watt. What are the gadgets I can plug to this inverter? Mobile chargers, laptop chargers, CFL lamps, tube lights. Incandescent lamps, soldering iron, regulated power supplies, SMPS. What you should NOT plug to this inverter? Any lifesaving or medical equipment or any measuring instrument that uses this inverter as its power supply. If you have any questions regarding this inverter, please comment your questions you can anticipate a guaranteed reply from us. sorry, I did’t document a video while prototyping. Right click and save it! or long press the image and save it. i have complete the full bridge ckt but output voltage is 118v.what is fault in this ckt? You have done nothing wrong, we published a wrong H-bridge configuration. If we are using 4-Channel MOSFETs then we have to bootstrap the MOSFETs for proper biasing. Now we have updated to two N channel and two P channel MOSFET configuration, for this bootstrapping is not required. 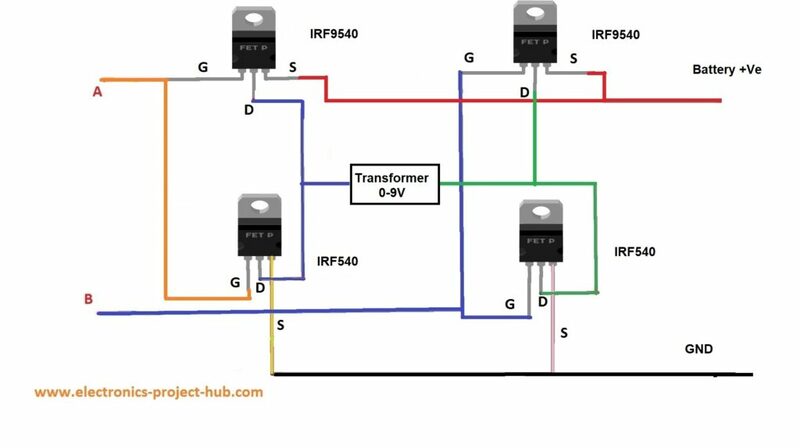 You have to replace two IRF540 with two P channel IRF9540 MOSFETs as shown in the updated diagram. We respect your efforts in making this inverter, we regret our mistakes. Forget simulation, it works practically. The updated H bridge ckt not work we need to on a pmos and a nmos at a time. The updated H-bridge circuit is correct! we have done in-depth analysis. One N-channel and one P-channel diagonal MOSFETs turns on when you apply HIGH to A and LOW to B and vice versa.